Join Sabine for a fun dance cardio class through SwingTrain. SwingTrain is a fun and effective dance cardio workout inspired by the joyful, energetic sounds of Charleston, swing, gospel, electro swing and hot jazz. It uses the classic moves of the swing era (1920s-1940s) such as Charleston and Lindy Hop to create an effective, vintage inspired cardio workout. Classes are held Mondays 19-19.45 at the Swing Wasa studio. Please wear indoor (or dance) shoes, comfy clothes. Feel free to bring your own Yoga mat and don\’t forget your water bottle! Free parking along Kauppapuistikko and Tiilitehtaankatu. Please use the side door (town square facing side). *Concessions include students, unemployed, single parents and seniors. 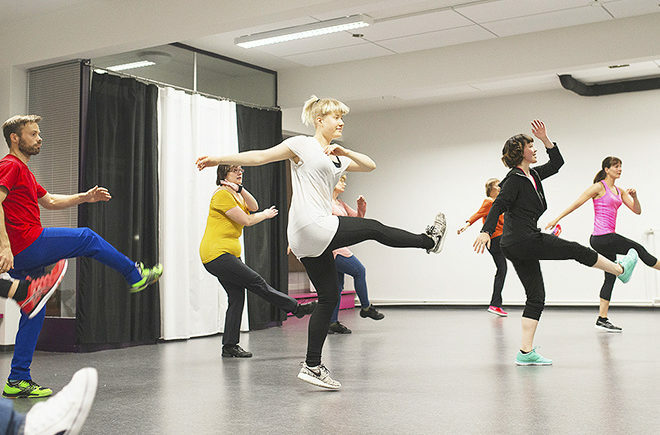 Treenit pidetään maanantaisin klo 19-19.45 Swing Wasan studiossa. Ota mukaan treenivaatteita, sisäkenkiä ja vesipullo. Joogamaton saa myös tuoda, jos on. Ilmainen pysäköinti kadun varrella tai Tiilitenhtaankadulla. Sisäänkäynti sivuovesta. Vi tränar måndagar 19-19.45 vid Swing Wasa, Handelsesplanaden 38. Ta med inneskor, bekväma kläder och en vattenflaska. Om du vill, så ta med din egen yogamatta. Gratis parkering längs esplanaden och Tegelbruksgatan. Ingång via sidodörren (torgsidans kortsida).